This skyscraper with a zig-zag channel cut into the facade is the winning design by Italian architects Massimiliano and Doriana Fuksas in a competition to design a new office building for Shenzhen. Lobbys, public spaces and gardens will be arranged along this diagonal void, which will also form a 200 metre-high atrium for the building’s entrance hall. Called Shenzhen Guosen Securities Tower, the glazed building will be 200 metres tall, incorporating 68,000 square metres of office space and retail units up to the first floor. 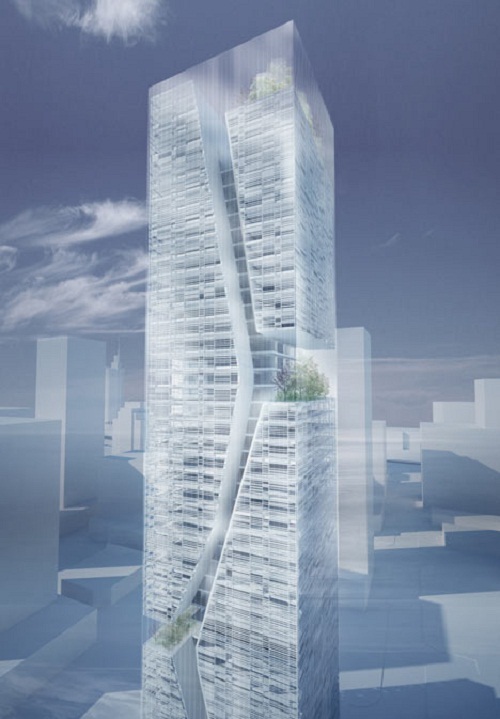 The project by Studio Fuksas is born from the intention to create a new concept of vertical public space for the tower. A three-dimensional void will be arranged along the facades giving a dynamic image to the building and creating different public scenarios for the offices. The design of the void shape explores the relation between the podium and the vertical section of the tower with diagonals spaces and fluxes that create a vertical tension in the full height of the tower. Guosen Tower’s distinctive fae atrium, with an energizing and dynamic form, will establish a new symbol for the CBD skyline. With its 200m height space, the tridimensional atrium will be the highest lobby in the Shenzhen. The public spaces, lobbies and Sky-Gardens are interconnected along the tridimensional void of the atrium creating a stream of light, images and activity. The building itself will be symbolically open to the city along the great fa?e atrium. 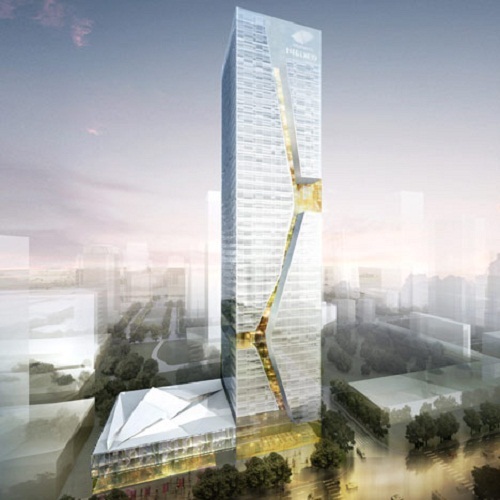 Guosen Tower design integrates the values of connectivity and trade fluxes of Shenzhen CBD into an innovative vision for a XXI century tower. Integrated in the complex skyline of the CDB, Guosen tower will respond with a pure external glass volume. All the complexity happens in the internal network of public spaces that are placed strategically in the facades taking advantage of the views and visibility according to the urban context. The upper levels of the building include the office complex of Guosen Securities, with an access highlighted by a triple height sky lobby. The very top le­vels are dedicated to the executive’s offices, including a sky garden and club room levels that offer a spectacular 360-degree panorama across Shenzhen CBD.